This bathroom is part of an attic master suite that we created from an unfinished space. This was a huge project requiring all new electrical, plumbing, HVAC, insulation, framing...you get it. The works. The homeowner loves navy and gold, which was a breath of fresh air for us as it was a departure from what so many people were asking for at the time. 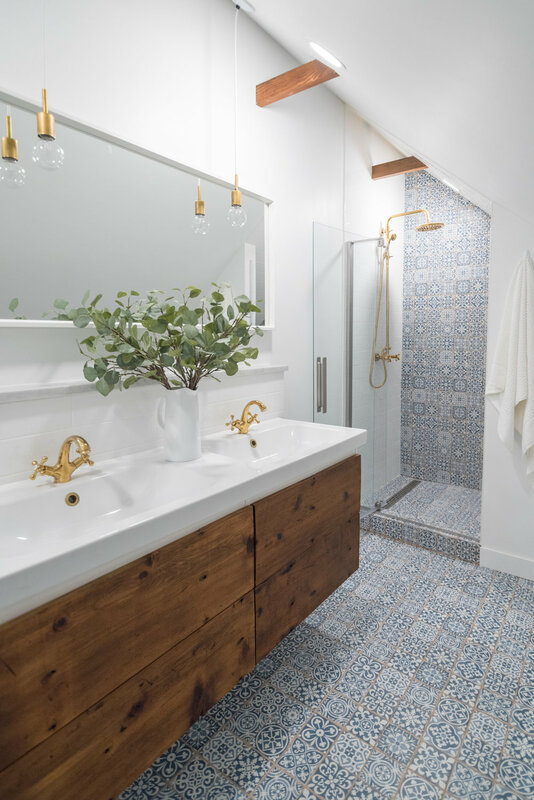 The entire design was inspired by the amazing blue and white tiles that we ran on the floor and up onto the back shower wall. Space was tight as the bathroom was on the side of the staircase and between the angled ceiling. We laid everything out the long way with the center wall in the middle of the space so that ceiling height was maintained where it counted. 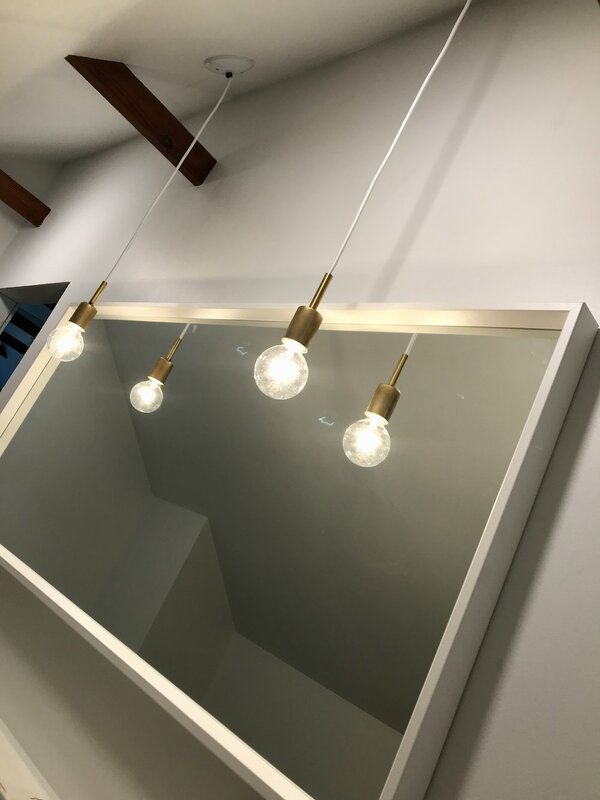 We have to say, this bathroom turned out amazing! Make sure to read our posts on this client's kitchen remodel and the rest of the attic master suite. Our specialty is making ordinary and/or affordable materials look expensive and custom. In this bathroom we used an IKEA vanity but then pulled up some of the floor boards and refinished them as the drawer fronts. The rustic wood softens up an otherwise modern bathroom. For extra counter space we created a ledge behind the vanity. We were finishing up their kitchen at the same time so we scored a great deal on the Carrara marble shelf that you see above. We brought gold in the fixtures. Gold isn't a hot trend right now, so try finding a lot of affordable options? Ya, there aren't many! Links to all the material sources at the bottom. Now for the before, during and afters pics! The bathroom will go to the right of the staircase, so in front of where you see the gal standing. See those floorboards? Those will become the vanity drawer fronts. White paint color is Bowline NT595 from Nautica (available at Menards). It's our favorite bright white and we have it matched by any paint vendor we use on a project. Staging items: Chairs are both vintage. We have a slew of staging items in our inventory that we use from project to project, so if you have a question on anything in particular send us a note!